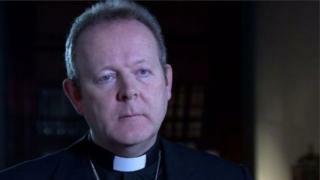 Archbishop of Armagh, Eamon Martin, has been appointed apostolic administrator of the diocese of Dromore by the Pope. Bishop Boyce's appointment was also controversial, with one retired priest saying he was "disgusted". In a letter issued to Dromore's 90,000 Catholics, Archbishop Martin said it was his aim to "provide as much stability as possible for Dromore" while awaiting a decision from Pope Francis about the appointment of a new permanent bishop. "I am humbled by this request from Pope Francis and grateful for his confidence in me," Archbishop Martin wrote. "I shall, of course, fully cooperate with developments in this regard," he wrote. Fr Murray said at the time that news of Bishop Boyce's appointment as John McArevey's replacement "rubbed salt on the wound" of an already hurt community.